House Was Shaking, Kids Were Screaming, We Wondered if the Police Were On Their Way! The most exciting problem was definitely the security system. 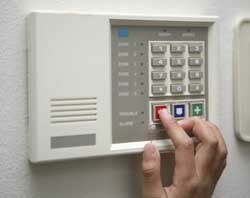 On day one, while unpacking, the alarm system started lightly buzzing. There are a few keypads around the house, and one of my fellow guests just started pushing buttons and it stopped. Okay easy enough fix, but we were somewhat curious about why it went off in the first place. Anyway, we continued on with our vacation. Day two: alarm goes off again. We pushed more random buttons. It stopped again. On with the vacation. Day three: Alarm goes off AGAIN. A FEW TIMES. Okay, this is getting annoying. I call the rental management company. The very nice lady at the rental company says the alarm is totally turned off and it should not be doing anything. She gave us a "magical code" to enter the next time it happens. Very exciting. We kept it in a secure place posted to the wall in the kitchen. That night at 2:22 AM, guess what happened? Yes, the alarm went off again. And apparently I am the only one with super alarm-hearing ears, and so I was the only one who heard it. I did get to use the magical code though. It turned it off. Much like random pushing buttons turned it off before. The next day, I called the rental company again. Because random alarms during the day are (sort of) fine, but random alarms at 2:22 AM are not (sort of) fine. The serious tone in my voice successfully conveyed to management that we needed to bring out the big guns here. She decided that she needed to "call someone." So she called someone. Then called me back. Just for me, she secured a better, longer magical code for me to enter. This one is gonna do it she says: it will turn off the alarm for good and we should hear nothing more while we wait for the alarm company to stop by so they can check things over. I enter the better, longer, magical code. She waits on the phone while I do this. After a few beeps, I realize we have just initiated a bigger problem: Using this new magical code, I have now completely armed the house. We are in full lock-down mode. I can tell because the red light next to the word "Armed" is lit up. (The previous four days, the alarm system oddly enough said "disarmed.") Management lady says, "Ohhh" and then, "Hmmm." And then I said, "I'm a little nervous for the next person who walks in our door. We have people coming back from the beach shortly." "Yes, me too," she said. So she hung up. Not on me, but I really think she was really not sure what to do next, so I think she went to go ask someone. Then, guess what happened next? My hubby came in the front door!!!!!! I put so many exclamation points there because it was amazing - because of the sounds that started coming forth from the house. I think the house was shaking, along with the bam, bam, bam sounds and the ewwwy, ewwwy, ewwwy sounds. Some were high pitched, some were low. All the kids came running down the stairs, horrified looks in their eyes, screaming "WHAT IS HAPPENING?" with their hands over their ears. I tried to stop it: The original magical number didn't work. The second longer better magical number wouldn't stop it either. Pressing the star, star, off, off, pound, pound keys didn't help either. (I made that one up.) We ran outside. There, we sat, waiting, wondering if the police were on their way. I mean, isn't that the point? It was exciting, and ear piercing. After ten minutes it stopped on its own. I called management; it went straight to voicemail. I think they were panicking over there, and just didn't want me to hear them panicking so they didn't pick up. So then I called the number on the bottom of the alarm system. She said that since I wasn't the account holder and that since I didn't have the secret password to tell her, that there was nothing she could do, "her hands were tied," and that even though I asked for her supervisor, she indicated that there was really nothing that she could do and that I should have a nice day and then hung up on me. And yes she really actually hung up on me. Oh my Lord, thank goodness for my wine, and that I was on vacation, and that these kinds of things make me secretly laugh inside, or I would have been really mad. I really do love the experience and not just the final outcome, so I was really looking forward to calling them back. I did. This time, I immediately asked for the manager. After I explained the situation to him, as if I planned it, another person came through our door! LOL. CAN YOU HEAR THAT, MR. MANAGER? IS THERE SOMEWAY BEEP BEEP BEEP YOU CAN PLEASE EWWWY EWWY EWWY HELP US. THE CHILDREN ARE BEEP BEEP BEEP SCREAMING. I CAN'T HEAR ANYTHING YOU ARE SAYING TO ME. HELP US PLEEEEEASE. Those caps weren't just for show. I really did have to yell into the phone so he could hear me. It was classic. CLASSIC. I AM that renter that they'll be talking about, for at least the next week. The Alarm Company manager did end up escalating our issue, and we actually got to speak to a Security Technician shortly after all that. He gave me the super-duper code, which he probably stored securely in his wallet and shared it with no one, and it actually disarmed it for real. The security system was technically broken (which is why it was beeping in the first place, when it was set to be disarmed). When you are staying in a house that is not your own, like a guest does when they rent a vacation rental house, challenges sometimes come up that no one could have foreseen. From the rental management company, it takes patience, knowledge, and a desire to provide good, clean customer service. The rental company really had no idea what was happening nor how to fix it. And, I don't know where she got her codes from. I think back on day three, when she said, "the alarm is turned off and it shouldn't be doing anything" that should have been a clue that it wasn't working properly. Maybe next time, they will look into the issue sooner, to get the security company out there sooner. But, then, I wouldn't have such a good story to tell. As a vacation rental manager or owner, how do you make sure the same mistakes don't happen again as you are running your business? What should they have done, if anything, to not let it get so bad?